We recognise that climate change has the potential to impact our business in a number of physical, commercial and regulatory aspects. We manage climate change risks in terms of our own greenhouse gas (GHG) emissions, as well as considering the potential impacts of climate change on our assets and business. Climate change is expected to result in an increase in the frequency of extreme weather, as well as changes in long-term average conditions. Physical risks are mitigated through the design and construction of climate-resilient assets. We are working with our construction partners to assess climate change risks in the design phase of major projects so we can take measures to help us adapt. Our Scope 1 emissions comprise fuel use from vehicles and machinery on our assets. Transurban owns a relatively small fleet of vehicles and the majority of fuel use is from major contractors. Our major source of greenhouse gas emissions is the energy use of our road assets, particularly tunnel ventilation and lighting. This represents Scope 2 emissions. In addition to the energy-reduction initiatives outlined in the ‘10 in 10’ section of this report, we also operate solar panels or purchase Green Power on a number of our assets, which contributes to low-emissions electricity generation. We calculate corporate Scope 3 emissions based on supply chain fuel and electricity use, corporate air travel, and emissions from landfill waste. These are the Scope 3 emissions sources over which Transurban has direct control. The emissions of customer vehicles on our roads are significantly higher than our emissions as a business. We estimate these as a category of Scope 3 emissions which we can influence but not control. Our road assets are designed to reduce congestion and travel time and improve traffic flow compared to alternative routes, which results in improved vehicle fuel efficiency and reduced emissions. Following the acquisition of Queensland Motorways, Transurban reached a threshold of total greenhouse gas emissions that now requires us to report under the Australian National Greenhouse and Energy Reporting (NGER) Act. We also monitor greenhouse gas emissions on a number of assets that are outside of NGER reporting requirements, but used for internal purposes and our annual Sustainability Report. 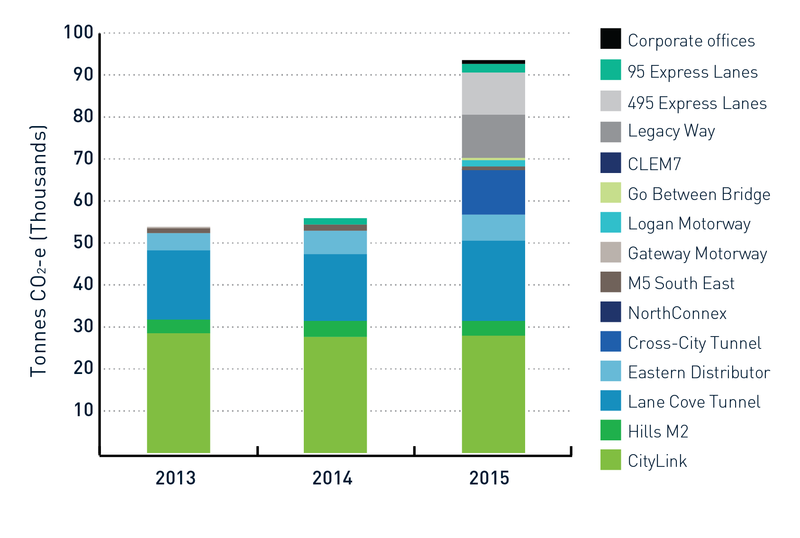 In FY15, Transurban’s total Scope 1 and 2 emissions were 96,115 tonnes CO2-e. This marks an increase from FY14 driven largely by the acquisition of Queensland Motorways assets and the Cross City tunnel, and the opening of the new 95 Express Lanes. The trend in Transurban’s Scope 1 and 2 emissions is shown below. Transurban’s Scope 1 emissions arise from the combustion of fuel in vehicles and generators, and represent around 2% of the total of Scope 1 & 2 emissions. Transurban includes fuel usage in its Group total only for assets over which it has operational control, as defined by the NGER Act. Operational control represents the degree to which Transurban has direct influence over an asset or facility. This often means whether Transurban is the operator of the asset, or whether a contractor has that role. On assets where Transurban has operational control, fuel used by major contractors is also included in our Group total since Transurban has significant control over contractor practices on those assets. This classification is consistent with how Transurban will report under the NGER Act (with the exception of our US assets, not reported under Australian NGER legislation). Transurban’s emissions increased slightly compared to FY14 owing to the inclusion of several major contractors into Transurban’s Scope 1 emissions for the first time in FY15, as we begin to report under the NGER framework and align our Sustainability Reporting to the same scope. These contractors are only included on assets where Transurban has operational control since we have greater ability to influence contractor behaviour through environment and safety policies. We do not report fuel use and Scope 1 emissions on assets where contractors have operational control. In FY15 this includes Eastern Distributor, Cross City Tunnel, NorthConnex, M5 Southwest, Westlink M7, Clem7 and Legacy Way. Scope 2 emissions from purchased electricity continue to be our largest source of emissions, accounting for around 98% of the total of Scope 1 & 2 emissions. Our corporate Scope 3 emissions — not presented in the graph above — are also strongly driven by emissions from the upstream transmission and distribution of electricity, and also tend to vary more with construction activity due to the impacts of Scope 3 emissions from waste generation. We also report on the estimated greenhouse gas emissions from customer vehicles travelling on our roads. This estimate is based on the number of vehicles travelling on our roads, vehicle types, distance travelled per trip, average vehicle speed and emissions factors. Scope 3 emissions from customer travel are strongly driven by the number of vehicles on our roads each year. In FY15, we estimate that vehicles on Transurban roads contributed to approximately 1,685,752 tonnes CO2-e.
Air quality is an important environmental measure for our road assets, with large numbers of vehicles travelling each day. Transurban ensures that air quality is monitored and controlled so that conditions both on and near roads are maintained to a high quality. Road tunnels have specific regulations in place for maintaining air quality within the tunnel, where vehicle exhaust is diverted via tunnel ventilation systems. We monitor and report air quality within our tunnels and at the exhaust stacks, to ensure that regulatory standards are met and air quality is maintained. During the design process for the NorthConnex tunnel in NSW, there was some community concern about the proposed ventilation stacks and whether exhaust air would have an impact on local air quality. Transurban demonstrated the air quality modelling and safety assessments that had been undertaken to ensure that air quality at the outlet of the tunnel ventilation system would be safe for local communities. This included a series of studies completed by independent experts to ensure best practice air quality and safety practices were achieved. The NorthConnex tunnel will divert significant truck traffic from other local roads which will lead to improvements in roadside air quality on those routes.